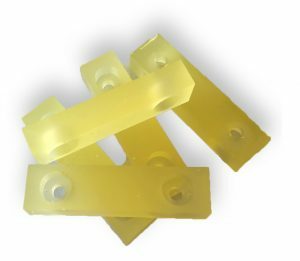 Urethane rebound stops that we manufacture offer different diameters, grips, speed and durometer ratings are manufactured here at Plan Tech. The rebound is a very important factor because it determines how fast you can roll while using it. Our urethane rebound stops are made from pure polyurethane because of the strong properties of urethane. An important factor Plan Tech engineers consider is the ability of the urethane rebound stops to return to its original shape after an external force is applied. This quality is very vital because it is used to minimize the rolling resistance of the rubber rebound stops. Superior Abrasion Resistance Additives: Plan Tech is a leading cast polyurethane supplier that also has a custom line of additives. One of the most commonly used additives is Armorglide providing superior abrasion resistance for high use applications. Are you interested in cast Urethane Rebound Stops? Please Contact us so we can help solve your requirements and work with you on your specific application!